Once again, the US government has allowed your tax money and the nation’s security to be compromised in ridiculous fashion. On Friday, April 8, 2016, the US Navy charged an active-duty maritime reconnaissance officer with passing US military secrets to a foreign government. The US Navy filed multiple charges, including espionage, against Lieutenant Commander Edward Lin during an Article 32 hearing in Norfolk, Virginia. The Navy explained that, “NCIS and FBI are still investigating the details of this case, and, therefore, we cannot provide any additional details at this time.” Since then, unidentified Navy officers have identified the accused as Lt. Cmdr. Lin and the beneficiary of Lin’s espionage work as Communist China. You remember China? It’s that country that has been rapidly expanding its military and is claiming large areas of international waters as their national domain. Yes, that China. Though redacted, the charging document describes a depressing story in which Lin transported secret information out of the country without permission and then lied about his whereabouts when he returned to duty. The charging documents allege that Lin successfully committed espionage twice and attempted espionage on three other occasions. Lin is currently in pre-trial confinement at the Naval Consolidated Brig in Chesapeake, Virginia. Given that Lin had a high security clearance and served on E-P3E Aries II reconnaissance aircraft, he likely did tremendous damage to the US. The technical and operational information that Lin was entrusted to safeguard constitutes an intelligence coup for Communist China. 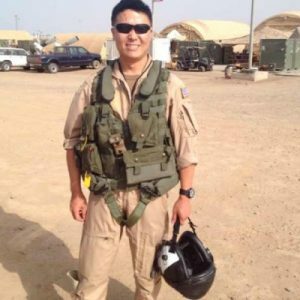 The reporting on this case will understandably focus on Lin’s access as an officer in the Commander, Patrol and Reconnaissance Group. However, Lin had access to a whole other trove of treasure for China. He served as the Congressional Liaison for the Assistant Secretary of the Navy for Finance Management and Comptroller from 2012 to 2014. In his position as liaison to Congress, Lin would have had access to a vast array of sensitive information from every part of the US Navy. It would be easy to assume that Edward Lin went to great lengths to succeed at such a villainous subterfuge. He didn’t. It was all too easy, and anyone could do it. Most of the outrage – all of which Lin and my beloved Navy deserve – will be directed toward Edward Lin. In my opinion, Lin is just one small aspect of a much larger problem that we should not continue to ignore. How did the US Navy, the FBI, and the rest of the US government manage to miss Lin’s (alleged) spying for what was likely more than a decade? In the case of the FBI, we can forgive them if their pathetically small counterintelligence efforts missed Lin. Given their lack of resources and minimal mandate, the only surprise from the FBI counterintelligence team would be if they ever actually stumble upon an espionage operation. I am not knocking the FBI agents tasked with counterintelligence. They are undoubtedly as well trained and dedicated as other FBI agents, but they simply lack the means to conduct anything like an effective counterintelligence operation. As for the US Navy, the Department of Defense, the Executive Branch and the Legislative Branches, I am much less forgiving. For one thing, Lin was a Taiwanese-born Taiwanese citizen until he was 14 years old. I disagree with the current policy that allows foreign born naturalized citizens to so easily gain high security clearances. I’m sure it’s the more politically correct thing to do, but it’s an asinine policy. This is not the first time that the United States has lavished secret information on a Taiwanese born “alleged” spy. Refer to the Wen Ho Lee* case if you are uncertain of the wisdom of this policy. In any event the proof is in the pudding, or in this case, the proof is in the feast that Lin served up to hostile Communist China. If Lin is indeed guilty, then he deserves a life sentence of hard labor at Leavenworth or some obscure distant location. Most of my cohorts in the US Military and the US Intelligence Community will likely disagree with me and would prefer for Lin to be executed. I can’t agree to that because I don’t support the death penalty. All judicial proceedings depend on the integrity and wisdom of those involved in prosecutions, and I can’t ignore that people are not perfect. For example, the government that is prosecuting Lin is the same government that was stupid enough and careless enough to make it easy for Lin to rob the taxpayers blind and endanger our national security. We now know about Edward Lin, which begs a question . . . Who do we not know about? Regardless of the outcome of Lin’s trial, we, as American citizens, should start demanding better security standards to protect our national security and the billions of dollars in technology that we are all financing. Until our politicians have reason to think that the public is paying attention to our pathetically poor security policies, they will have no motive to fix it. I hope that all of our readers will look beyond Edward Lin and tell their Congressweasels and their White House to start acting like adults on issues of national security. Edward Lin, if guilty, is a dangerous criminal, but this is a democracy, and We the People allowed him to do what he did. * Note to Wen Ho Lee: I am not the New York Times. Don’t dream of sending lawyers in my direction. You and I have met before. I meant what I said . . . Does your hand still hurt? Hi K.B. Thanks for visiting. Please consider expressing to your concern to your states US reps and Senators. The current laxity in security is pathetic. Wow- I think I’m going to have to read this several times to take it all in. Do you think they are aware of how much was actually given to China? Just because they caught him three times doesn’t mean that’s everything. “Hi Alica. I suspect that he was prepared to work for Communist China before he received his commission in as a Navy Officer. I accept that the Navy may not wish to fully inform China about how much they know about Lin’s efforts. They may be protecting sources. I agree with you that Lin is not the sole perpetrator in these cases. People may not appreciate that a Chinese foregn-born individual who enters the military, receives an officer commission, and then receives high clearance should not be allowed to do so in our US military given our relationship with China. I think many people in the military would agree with your statement. But the military is part political and I think it would not accept any culpability and will give it all to Lin or pass the buck. In some strange way, one could say Lin is the scapegoat for lax measures in national security secrets. In the meantime, like you, I hope Lin is not killed and instead receives life imprisonment. Maybe we use Lin for decoding Chinese secrets or something similar. Just a thought. And of course, we should all have words with our State Senators and Representatives about problems regarding our National Security since we give up certain freedoms. Excellent article as usual, Jay! Hi Mliddle. Thanks for your visit. You are right. Until our Congress demands changes from the US military and the broader intelligence community this sort of absurdity will continue. “National Security” would be an excellant topic at the presidential debates. Thank you for an enlightening article. Please say “HELLO” to Piper for me, thank you!